New to version 5 is a pair of macros that are designed to work together: Convert Highlights to Styles and Convert Styles to Highlights. 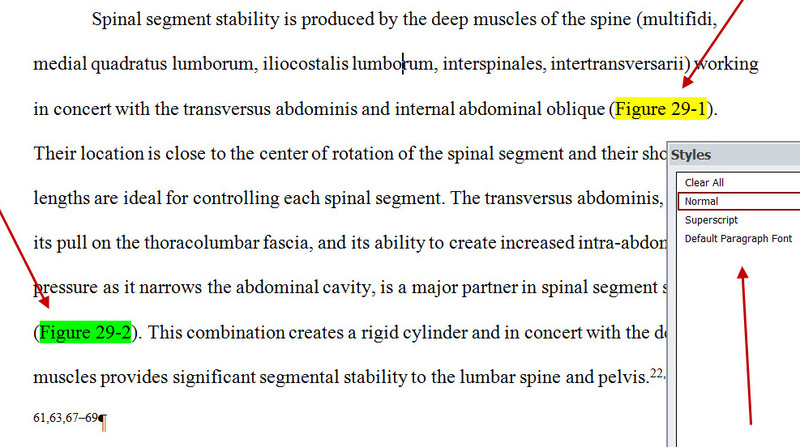 EditTools relies on highlighting to give an editor information about a manuscript. Consequently, if an editor receives a manuscript that already has highlighting in it that needs to be retained, the editor has a dilemma: If the editor uses EditTools, then when done editing a chapter either all of the highlighting has to be left, which makes for a messy manuscript, or all of it has to be removed using the Remove All Highlighting macro. The Choose Highlighting to Remove macro doesn&apos;t work in this circumstance because whatever material was highlighted by the client can&apos;t be separated from the material highlighted by EditTools. The answer is this pair of macros: Convert Highlights to Styles and Convert Styles to Highlights. When done editing, and after running the Remove All Highlighting macro, running the Convert Styles to Highlights will return the figure callouts in our example to their original colors and will remove the styles. 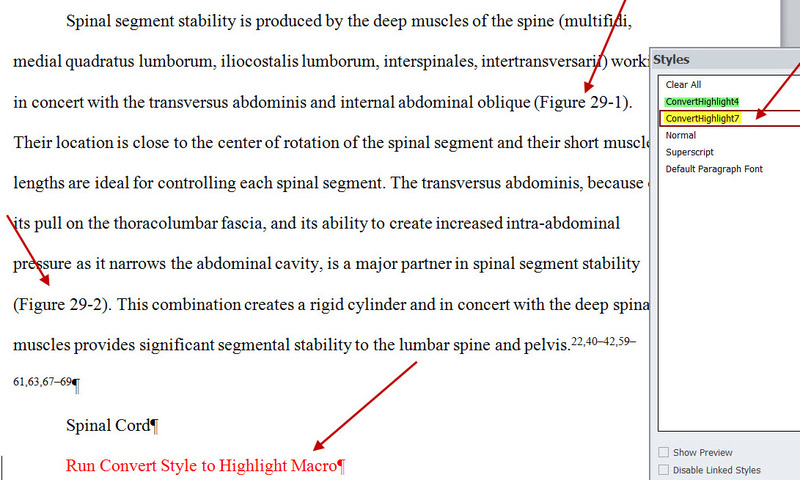 Be sure to run the Convert Highlight to Styles macro before you run the Never Spell Word or Journals macros. Those macros insert highlighting that will be converted to styles if the Convert Highlight to Styles macros is run after either or both of them. When you are done editing, run the Remove All Highlighting macro before you run the Convert Styles to Highlight. If you run it after the conversion, you will remove all of the highlighting from the document, including that highlighting you intended to keep. *There is no ConvertHighlight8 style.